Since their publications in 1982, Samuel Shirley's translations of Spinoza's Ethics and Selected Letters have been commended for their accuracy and readability. 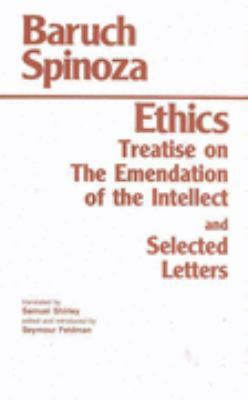 Now with the addition of his new translation of Treatise on the Emendation of the Intellect this enlarged edition will be even more useful to students of Spinoza's thought.Spinoza, Benedictus de is the author of 'Ethics ; Treatise on the Emendation of the Intellect ; Selected Letters' with ISBN 9780872201309 and ISBN 0872201309. Loading marketplace prices 26 copies from $3.49 How does the rental process work?